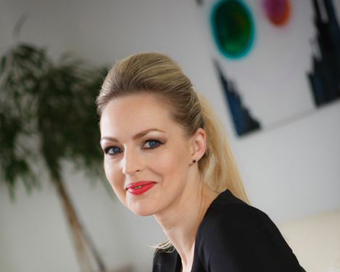 In the hot seat for June’s Women Who Launch is Angela Mahon, Truzees. Truzees is for the true to life parenthood moments. We design a range of fun and functional gift products for new parents. Keeping it in the Midlands! Our studio is based in Tullamore, Offaly but we warehouse and distribute our products in and from Portarlington, Laois. We are currently building towards a staff of three by the end of this year. 2016 is going to be a big year for us and we look forward to future happenings. An ambitious brand, but our mission is to help parents all over the world feel better through our products. The New frontiers, phase two helped kickstart our business. I have also invested my own funds. There are numerous capital funding options available – all of which we will be looking into over the coming months. Our products are for parents deep in the trenches (and nappies) – parents who need some fun and humour brought to the parenthood journey! Many of our products fall into the baby gift category. We had initially defined our target market as the baby gift buyer but have recently had some surprises since our launch. About 70% of our buyers to date are mothers and fathers who have treated themselves! Design-led companies with products or surrounding that are a joy to use or be in. Companies such as Apple (For the products I could not live without), Designist, Avoca and the Arboretum in Carlow (for their amazing stores and products – I could literally walk for days in these places). I am also a lover of brands that make me laugh and believe it or not, I tend to frequent Joe.ie and the Lad Bible quite a bit for some lighthearted fun. Being shortlisted in two categories and winning the Bank of Ireland National Craft Based Startup of the Year Award just three weeks after launching! To get that recognition at such an early stage was very motivating. Still on a high the following afternoon, I was scrolling through my Snapchat updates and spotted Irish fashionista and model Pippa O’Connor pouring her morning coffee into our Sleep Deprived Mummy Mug. That pretty much topped it for me. I have heard the phrase “you are too early” when it came to seeking funding. I personally don’t believe ‘too early’ is a thing. However, I do believe in bad pitches, bad communication and bad timing – most of which was a problem of mine at the beginning. It’s important to not take things personally and to use criticism as constructive feedback to develop your messaging and business. Social media is a fantastic promotional tool to spread the word about your brand. I don’t have what you would call a ‘huge’ following but I do have good engagement, which has directly resulted in sales. Most of my followers have a genuine interest in what I do and I will try to provide products, services and fun content that gives right back. Truzees is all about bringing fun to the parenthood journey so future technology developments are not off the cards. A different industry to Truzees but the LUSH Cosmetics Company innovates and rolls out new products on a quarterly basis. Some of their funkiest and off-the-wall ideas were initially rejected by the big boys but are now their biggest hits. Clever – I wouldn’t be what you would call the typical book smart type but I am clever in terms of conjuring alternative solutions to problems. Worst: Stubbornness – sometimes the good traits can have their bad days too! Stress – Catch 22! I absolutely love the busy days but I can get stressed out when overloaded with work tasks and deadlines. There are so many I would love to sit and chat with. When I first began to have an interest in business, the only prominent female entrepreneur figure I could relate to in the media was Norah Casey. She is what I call the original Woman in Business. For that reason, I would love to sit and chat to her. The king of branding – Richard Branson! Undoubtedly, he would take Truzees from a recently launched brand to an internationally recognised brand. Don’t take it personal. Listen to feedback, develop and keep your eyes peeled for opportunities.